We’ve known for more than two years that Facebook has been working on a version of its app for organizations. It’s now out of beta, has a new name and is available to everyone, and it’s called Workplace. The idea is to streamline companies’ intranets and reduce the need to rely on multiple mediums for internal communication. Facebook has been testing Workplace with more than 1,000 companies worldwide for over a year now, and the launch of the service sees it incorporating feedback from those who’ve had early access to it. Workplace looks and feels awfully similar to Facebook’s social network; the main difference is that all the updates, information and posts you’ll see there are from within your company. And it works for teams of all sizes, from garage-based startups to multinational corporations. As with the social network, you can create groups, post updates, tag people, share files and chat with multiple users at once. It also offers Work Chat, which is essentially Messenger for you and your colleagues. There are options to run one-on-one video calls and group audio calls, as well as Facebook Live video broadcasts for things like all-hands meetings and major internal presentations. Workplace also offers enterprise-friendly features like analytics dashboards, single sign-on support and the ability to work with identity providers to allow users to access the app securely. Soon, it will also allow the creation of Multi-Company Groups so employees from various organizations can collaborate easily on shared projects. The service is priced at $3 per user per month for the first 1,000 users; it goes down to $2 for the next group size of up to 10,000 users and lowers to $1 for more than 10,000 users. It’s free for nonprofits and educational institutions; you can also try a 3-month trial with your organization at no charge. 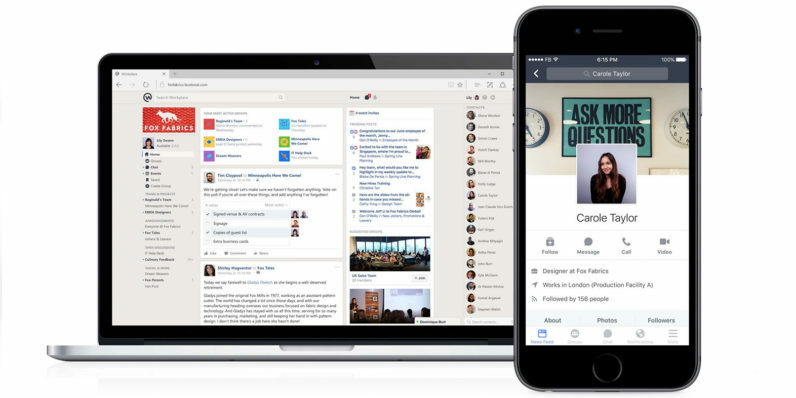 With that, Facebook is poised to take on collaboration apps like Slack (free – $12.50 per user per month), Microsoft’s Yammer (bundled with Office 365) and Atlassian’s HipChat (free – $2 per user month). It has advantages like the ability to support with large enterprises and an interface that’s already familiar to most people with a mobile device (which means little to no time spent training employees to use it). However, it’s yet to integrate with or offer things like CRM and project management tools. It’ll be interesting to see how Facebook approaches this aspect of Workplace, and if it can indeed convince companies around the world to use a social network for increased productivity.